The Department of Energy honored five individuals with the Jeffrey A. Johnson award for their successful collaboration on the 2015 Washington State Energy Code amendments. The award was presented at the National Energy Codes Conference to Gary Nordeen, Washington State University; Louis Starr, Northwest Energy Efficiency Alliance; Chuck Murray, Washington Department of Commerce; David Baylon, Ecotope, Inc.; and Duane Jonlin, City of Seattle. 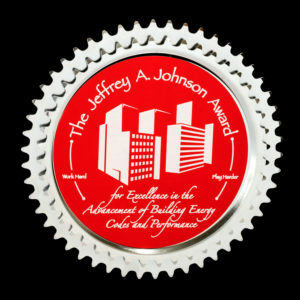 The award recognizes an individual or team in the United States for leadership in building energy codes in the pursuit of energy efficiency goals. Washington has some of the most stringent energy codes in the country due, in large part, to the contributions of these leaders and many other participants in the process.